Add a beautiful, natural looking raised garden bed to any space! 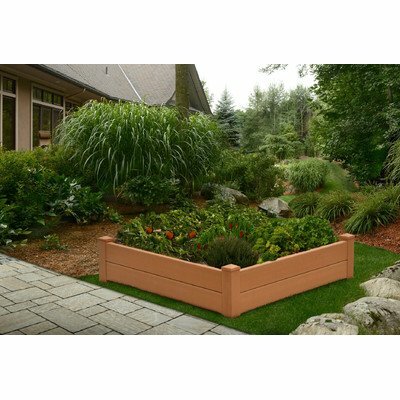 Sturdy and easy to assemble, the New England Arbors Chelsea Raised Garden Bed can transform your yard from plain Jane to a beautiful, landscaped refuge. Crafted from a revolutionary melding of vinyl and recycled wood, the Chelsea raised garden bed adds an unobtrusive beauty to any space. There’s no need to till or spend time creating a space – you can easily add a manicured, finished garden anywhere. The Chelsea minimizes weeding, and it’s maintenance free. You’ll enjoy your Chelsea raised Garden Bed for a lifetime – we warranty it for 10 years! About New England Arbors Co. The world's leading manufacturer of premium vinyl arbor kits, New England Arbors was founded in a simple barn in the late 1990's. There the founders began replicating the beauty of New England design with simple, low-maintenance vinyl materials. The business has grown since then, now supplying arbors and trellises all over America and beyond. With headquarters in Port Huron, Mich., and Sarnia, Ontario in Canada, New England Arbors is dedicated to the creation of the most attractive and durable vinyl arbors possible. Dimensions: 48L x 48W x 24H in. (Overall Dimensions). Dimensions: 48L x 48W x 12H in. (Installed Dimensions). Natural looking cedar construction. Meld of vinyl and recycled wood. Resistance to rot and weather elements. Simple and easy assembly. 10 year manufacturer warranty.